Since we’ve been all but snowed in for much of the recent winter, we’ve been visited by an even wider collection of bird life than usual. To pass the time, we’ve been pointing various photographic devices at our feathered friends when the opportunity arose. Our collection of piccies started me back on thinking that I should compile a photographic catalogue of our avian visitors. Whilst that was playing in my mind, this morning I thought that some birds would be almost impossible to capture on pixels (formerly celluloid). One such Holy Grail, albeit a reasonably frequent visitor, would be the Treecreeper – very small, very skittish and most frequently very distant. What should turn up this morning? 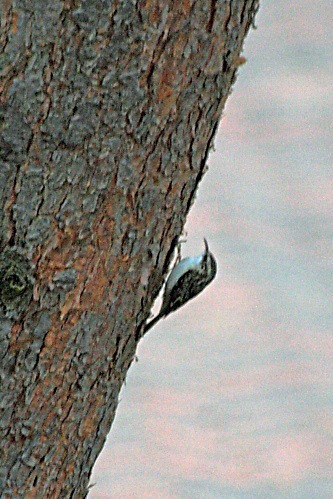 Yes, a Treecreeper, scurrying up and down the tree in our front garden. Actually, there were two of them. I can’t say that they are a pair waiting for spring but we can always hope. Somewhat hurriedly I grabbed my camera and longer lens and did what I could. I know it isn’t a good picture by any means but it was through glass and handheld at 1/30th second at 300mm (image stabilizer on). Until I have something more powerful, I’m very much afraid that this is about as good as I can hope to get. Spurred on by today’s new addition to the collection, I have published the beginnings of my Garden Bird photographic catalogue.